The Department for Environment, Food and Rural Affairs (DEFRA) has just published a report called Climate Change Risk Assessment (CCRA). It is the first assessment of its kind for the UK and the first in a 5 year cycle. The CCRA methodology has been developed through a number of stages involving expert peer review. The approach developed is a tractable, repeatable methodology that is not dependent on changes in long term plans between the 5 year cycles of the CCRA. The outputs have been extensively peer reviewed by scientific and economics experts, an independent international peer review panel, and have also been scrutinised by the Adaptation Sub-Committee of the Committee on Climate Change. In terms of methodology, a similar approach was taken as in IPCC scenarios. This means consequences of climate change are projected into the future without taking into account social, political, or technical change. The results, with the exception of population growth where this is relevant, do not include societal change in assessing future risks, either from non-climate related change, for example economic growth, or developments in new technologies; or future responses to climate risks such as future or planned Government policies or private adaptation investment plans. Excluding these factors from the analysis provides a more robust ‘baseline’ against which the effects of different plans and policies can be more easily assessed. However, when utilising the outputs of the CCRA, it is essential to consider that Government and key organisations are already taking action in many areas to minimise climate change risks and these interventions need to be considered when assess where further action may be best directed or needed. If you had to pick one particular issue I think the flooding issue is the most dominant. I tried to access the full report on DEFRA's website but it not available yet. "Unusually for such documents, it also highlighted ways in which the country could benefit from milder winters and drier summers, such as fewer cold-related deaths, better wheat crops and a more attractive climate for tourists." All the reports are now available for download at DEFRA. I'm been skimming them. So far, the most obvious oddities are that surface-water flooding isn't included and that development due to population growth is assumed to occur equally across the UK in the years ahead, with no measures to deter new development on floodplains, not even those measures that are already in place. The report admits that both are serious limitations. I think the former was imposed by a lack of data but the latter seems to have been adopted only for 'the sake of developing elegant scientific models', as you put it. It has an increasingly large impact on the report's headline projections as they move from the 2020s to the 2080s. Another worry is that in the 'Summary of Key Findings' the third of the ten 'Key Messages' from the report includes a warning that annual flood-damage to English and Welsh properties might be £12 billion by the 2080s. You have to dig very deeply into the report before you can find any support for this statement. Milder winters leading to 3,900-24,000 fewer premature deaths by the 2050s, significantly more than those forecast to die as a result of hot weather." 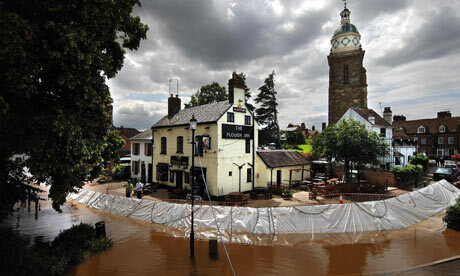 Global warming as a boon to England? The BBC is quick to add: "Such widely-varied outcomes may lead to the criticism that the results are too vague to be useful for policy makers, businesses and local authorities."